The Japanese White Pine – Pinus parviflora – prefers to be outdoors and create a striking landscape element wherever it is used. It often has a dense, conical form when young developing into a 25 to 50 ft. tall, graceful, irregularly shaped tree with a broad, flattened canopy. The 1 to 2.5 inch long needles are stiff and twisted, forming blue/green tufts or foliage at branch tips and creating an overall fine texture to the tree’s silhouette. The brownish-red cones are 1 to 4 inches long and persist on the tree for 6 to 7 years. The needles grow in groups of five, so this tree is also known as “five-needle pine,” especially the cultivar P. pentaphylla. The Japanese White Pine grows best outside as it needs plenty of natural sunshine and temperature changes associated with the seasons. The more sunlight and warmth your bonsai receives, the more often it will need water. More bonsai die due to improper watering than any other cause. Do not water the tree if the soil is damp or cool. Bonsai generally need to be watered every couple of days, but there is no set schedule. When the topsoil feels dry, water thoroughly and deeply. An old bonsai watering trick is to place the entire pot in a sink of water an inch or two deep. Let the water absorb from the holes in the bottom of the pot. An inexpensive moisture meter takes the guesswork out of watering. We sell them on our website. As with other pines, good drainage is essential for the Japanese White Pine. Fertilizing a bonsai is essential to its health because nutrients in the soil are washed away with each watering. Fertilizer is like vitamins and minerals for a plant. When new growth appears in the spring, it’s time to start feeding your bonsai. Use a slow acting organic fertilizer. Apply chelated iron 2-3 times per year. If you prefer to use chemical fertilizers, feed every other week during the same times with a half strength solution of a fertilizer for acid-loving plants such as Miracid. You may wish to alternate with a balanced fertilizer such as Peter’s 20-20-20 after considering the acidity of your soil mix. The Japanese White Pine root system should be pruned gradually in the course of repotting, to ensure always leaving a strong root system. Branch pruning and wiring should be done in late autumn, and the wire left on the tree for 6-8 months at most. Pinch new shoots in spring to 1/3 of their length. This will result in buds forming in the fall at the sites where the shoots were removed. The reason this might be done is to form very short internodes on the branches. If you choose to use wire, use the thinnest training wire that will hold the branch in the desired position. DO NOT WIRE A BONSAI JUST AFTER REPOTTING. Wind the training wire in the direction the branch is bent in order to keep the wire from loosening. Wrapping the wire too tightly will cause scarring. Begin at the base of the bonsai tree and slowly wrap the wire around the trunk to anchor. Continue along the branch you wish to train. Repeat the process as needed. Repot the young trees (up to 10 years) every 2 or 3 years. For older trees, repot every 3 to 5 years. Repotting can be done in spring before the candles open or in late summer or early autumn, after the heat of summer has passed. There are the two periods of greatest root growth in pines. Because of the rugged quality of the five-needle pine, a strong rectangular pot should be used. Pines need a deep root system, and five-needle pines especially need a deep pot to avoid uprooting by wind due to their dense foliage. Soil mixture should give a good blend of moisture retention and drainage with various experts differing on the percentage of coarse sand to be used. Repotting is necessary periodically to supply the plant with fresh soil. DO NOT FERTILIZE FOR 3-4 WEEKS after repotting. 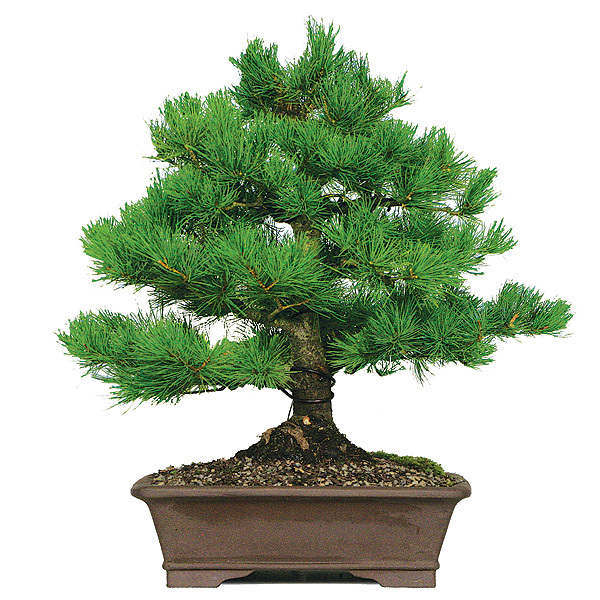 Check out our selection of outdoor Bonsai Trees right here!